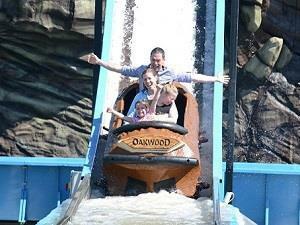 Oakwood Theme Park Theme ParkOakwood Theme Park is Wales’ biggest theme park, boasting over 40 rides and attractions full of excitement for children and adults alike. Explore the magical themed areas – Neverland brings the imaginative world of Peter Pan to life, and Dahland is inspired by the phizz-whizzing works of Roald Dahl. There are plenty of family-friendly rides throughout the park, including Skull Rock log flume, Tink’s Flying School swing carousel, the Jolly Roger Pirate Ship, the Flight of the Giant Peach, Treetops, and more. Enjoy a classic game of mini golf, or hop aboard a paddle boat to journey along the Boating Lake in the middle of the park. If you’re feeling daring, ride the adrenaline-fueled rollercoasters, including the UK’s number one wooden rollercoaster, Megafobia, the super fast Speed, and the tidal-wave-inducing Drenched. Escape from the dastardly Captain Hook in Neverland on through the Skull Rock cave on this log flume - prepare for the splash at the end! Oakwood Theme Park is Wales’ biggest theme park, boasting over 40 rides and attractions full of excitement for children and adults alike. Explore the magical themed areas – Neverland brings the imaginative world of Peter Pan to life, and Dahland is inspired by the phizz-whizzing works of Roald Dahl. There are plenty of family-friendly rides throughout the park, including Skull Rock log flume, Tink’s Flying School swing carousel, the Jolly Roger Pirate Ship, the Flight of the Giant Peach, Treetops, and more. Enjoy a classic game of mini golf, or hop aboard a paddle boat to journey along the Boating Lake in the middle of the park. You can pick up light refreshments, snacks, drinks, and home-cooked meals at the various restaurants and dining outlets dotted on the park grounds. Don’t forget to pick up a souvenir to remember your day or a special gift at the Whistlestop Shop. There are a number of places for food, snacks and drinks across the park. The Oak Tree Restaurant, Bar & Grill has a menu of locally-sourced Welsh food and children’s meals. The Little Darlings’ Cafe in the Neverland area serves a range of sandwiches, healthy children’s lunch boxes, hot drinks, and cakes. There are also stands throughout the park serving fairground food, and The Whistlestop Shop with gifts, confectionary, drinks and ice-creams. Opening and closing times vary throughout the year. Please refer to the calendar on the Oakwood website. The park opens annually from April to the beginning of November. Discounted prices for groups of over 15 people. Special group offers for school trips. Also accepts Tesco Clubcard Vouchers. Check the website for seasonal online discounts. By car: Look out for the Oakwood tourist information signs. The Theme Park is clearly signposted from the end of the M4 and throughout Pembrokeshire. You can find us off the A40 at Canaston Bridge, 8 miles east of Haverfordwest. By train: The nearest train station is Narberth, which is 5 miles from Oakwood. By ferry: Regular ferries cross from Ireland to Pembroke Dock, just 12 miles from the theme park. Please note: there is no bus route operating to the theme park.